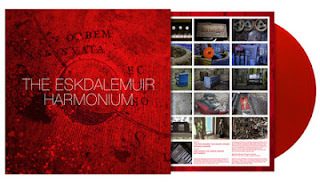 The Eskdalemuir Harmonium is a site-specific album orientated around a dying American harmonium - currently disintegrating in a farmhouse near Lockerbie. In this landscape, home to a vast Tibetan Buddhist temple and megalithic stone circles, artist and musician Chris Dooks has been making pilgrimages to the site, and collaborating virtually with Rotterdam based Machinefabriek(Rutger Zuyderveldt). The resulting album and supplementary digital package is a fusion of ‘folktronica-concrète’ replete with field recordings and a radio documentary. The package forms part of an ongoing investigation of how chronically ill individuals may benefit from working with equally collapsing instruments. This is an essential presentation for vinyl enthusiasts. The album, made over a twelve-month period, includes an essay and photographs of the year-long process and each vinyl bought comes with an expanded sister EP entitledNon-Linear Responses of Self-Excited Harmoniums. The record itself is lovingly pressed on bright red vinyl and is released by Toronto’s Komino Records, and copies should be available on the night. Much as one visits a sick relative in a care home, The Eskdalemuir Harmonium is a form of ‘sonic palliative care’ forming a third of Chris Dooks’ ongoing PhD. Hear him explain how this fits into his vision of ‘idioholism’ with excerpts from parts two and three of the trilogy.